Your personal nutrition plan starts with a simple system of supplements – USANA Essentials™. Together, the Mega Antioxidant and MultiMineral comprise the USANA Essentials for adults, and this duo delivers a broad range of vitamins, minerals and antioxidants to support the health of your entire body starting with your cells. To maintain optimal health, we need a variety of vitamins, minerals, bioflavonoids, and other micronutrients in the correct amounts – at optimal levels which surpass RDIs (recommended dosages defined by government agencies to avoid deficiency diseases) of those ingredients; in the right balance, and in the proper forms - that are of high quality and highly absorbable by the body. But obtaining these nutrients solely from diet has become a struggle with today’s hectic lifestyles and nutrient depleted food sources. 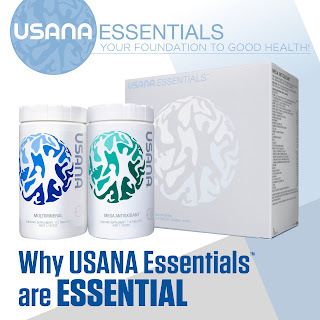 USANA understands the importance of providing the right nutrients, in the correct amounts, in the right balance, and in the proper forms for every age group, and has created the Essentials product line. Helping you build a strong foundation for exceptional health, the Essentials provide a comprehensive spectrum of the necessary vitamins and minerals adults need every day for optimal health and energy levels. USANA Essentials received the Top 5-Star rating, with Gold Medal of Achievement from NutriSearch Comparative Guide to Nutritional Supplements Fifth Consumer Edition. This comprehensive publication shows the results of in-depth comparisons of over 250 Australian and New Zealand supplements. Ratings are awarded according to critical health support criteria for each supplement and in light of the latest global scientific findings. The Mega Antioxidant is designed to support general health and well-being and to combat the damaging effects of free radicals (potentially damaging, highly reactive molecules). The Mega Antioxidant contains critical ingredients including lycopene, turmeric extract, coenzyme Q10, and alpha lipoic acid and Bioflavonoid Complex as well as Vitamin A, B and E plus Heart of the Olive and USANA’s Poly C™. The MultiMineral is the perfect complement to Mega Antioxidant and provides balanced amounts of important minerals. Minerals and trace elements represent less than one-half of one percent of the total nutrients we consume every day, and yet without them, our bodies would be unable to efficiently use the carbohydrates, proteins, and fats in our diet. Minerals play an essential role in the body. Many vitamins and enzymes need a mineral cofactor for proper function. The MultiMineral features Zinc, Selenium, Magnesium, Chromium, Iodine, Copper and Manganese. Both the Mega Antioxidant and MultiMineral are vegetarian safe and are laboratory tested, quality guaranteed. They meet the British Pharmacopoeia specifications for potency, uniformity, and disintegration where applicable. USANA’s Essentials provide the advanced nutritional foundation for every adult, every day, to support lifelong health. For more information about USANA’s Essentials click here (please log in to enjoy the Preferred Price) or watch our YouTube video here.